Birds are quite fussy when it comes to finding a suitable nesting site to raise their young. Cavity-nesting birds such as bluebirds, wrens, nuthatches and chickadees look for a hole inside of a tree or other natural crevice to build their nests. When natural nesting sites are scarce, these cavity nesters will take up residence in a birdhouse—but only if the nest box meets their high standards. 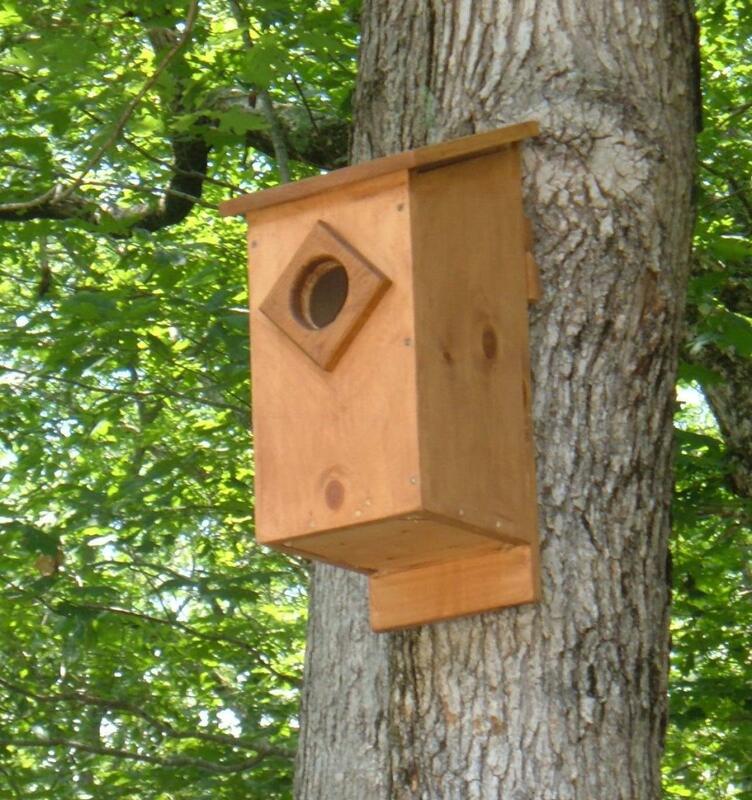 Many functional nest boxes that are designed to meet the bird's requirements are just basic boxes with a utilitarian appearance. 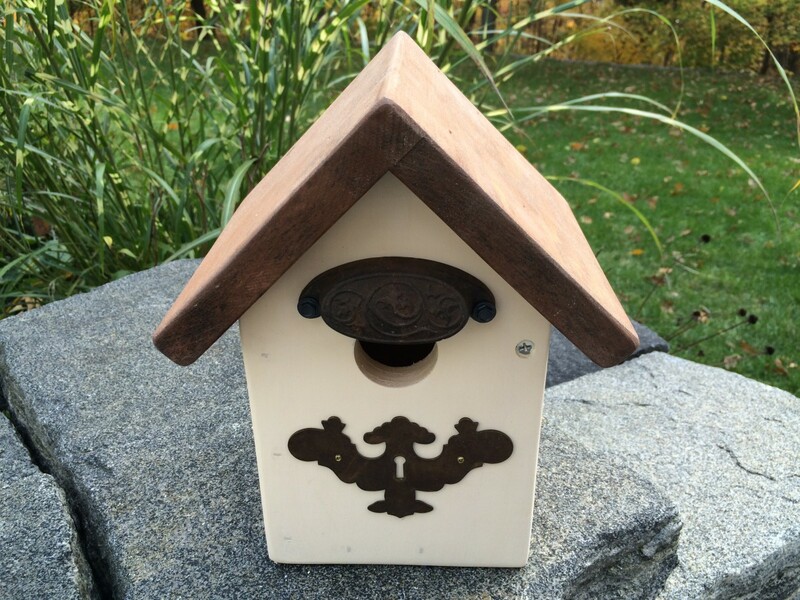 While these birdhouses may be well made, the basic nesting box is bland and not very interesting. 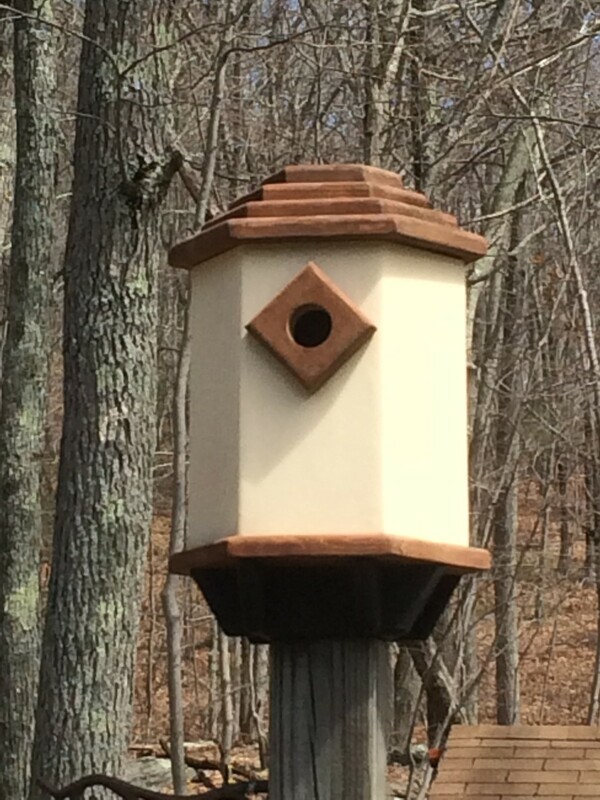 Commercially available decorative birdhouses may look good, but they often fall short on meeting the bird's nesting requirements and are less likely to attract birds. I've made many utilitarian birdhouses over the years, attracting a variety of cavity nesters who successfully raised generations of baby birds. And I've also built several rustic birdhouses with added design elements to increase their visual appeal in the garden, and the birds like these too. 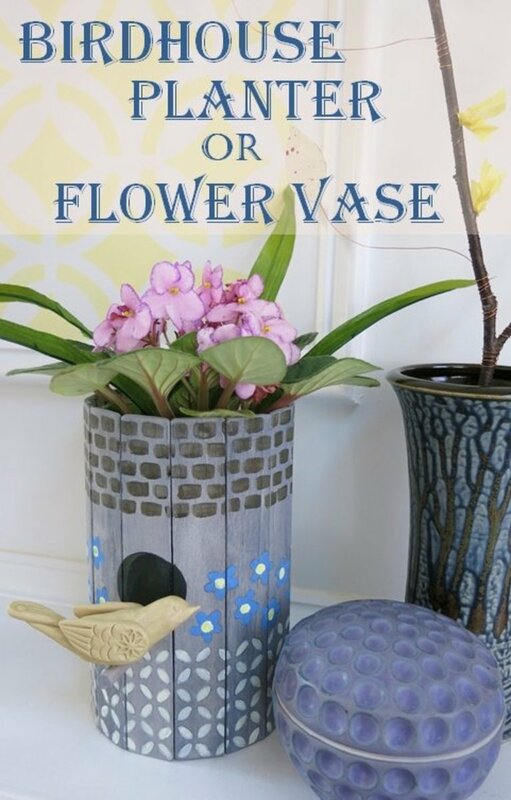 Starting with a basic nest box that meets the bird's requirements, I add a bit of whimsy along with a few recycled bits, and the resulting birdhouses can be both functional and decorative. The rustic birdhouses in the photo are built to the specifications preferred by Eastern bluebirds, then painted and decorated with pieces of salvaged wood to resemble picket fences and posts. 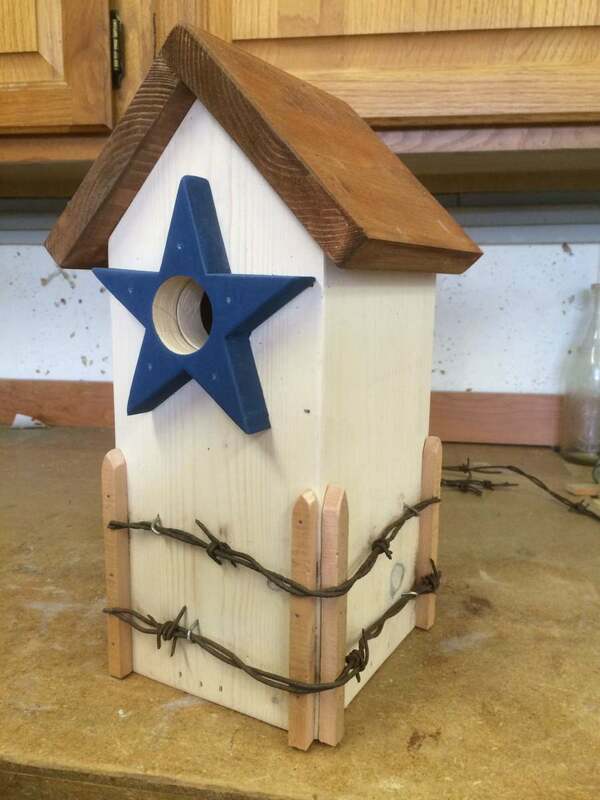 Rusty pieces of old barbed wire and a star-shaped entrance guard adds character to the rustic birdhouse design. These birdhouses were made from inexpensive pine boards that are readily available from the local home center, and from leftover pieces of wood from the scrap box in my workshop. 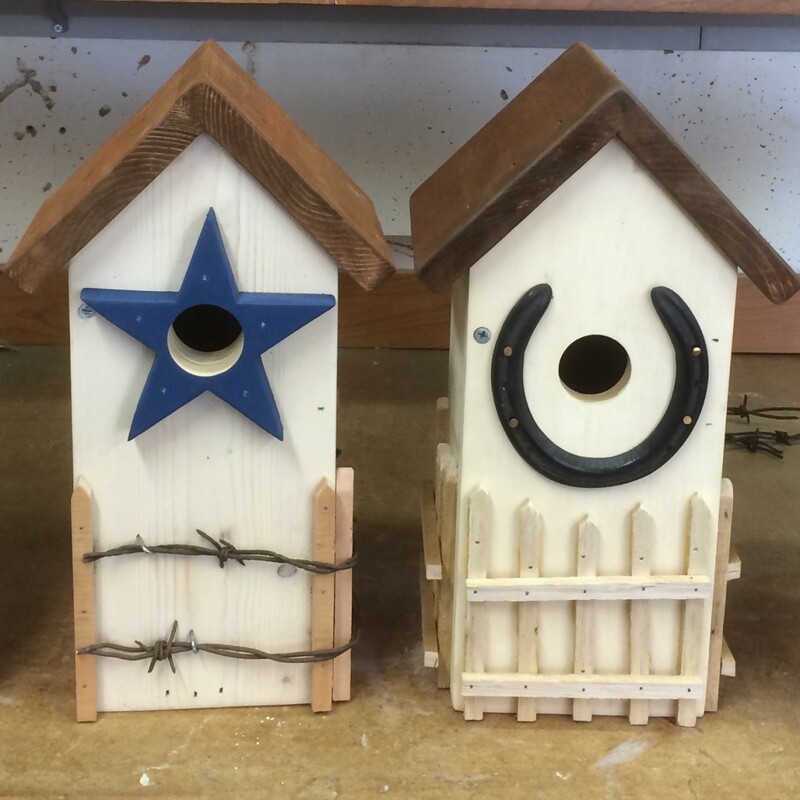 Rustic birdhouses can be made from pine, cedar, redwood or just about any pieces of salvaged lumber. Cedar, redwood, and hardwoods such as mahogany and teak are naturally resistant to insects and weather and tend to last longer when exposed to the elements. 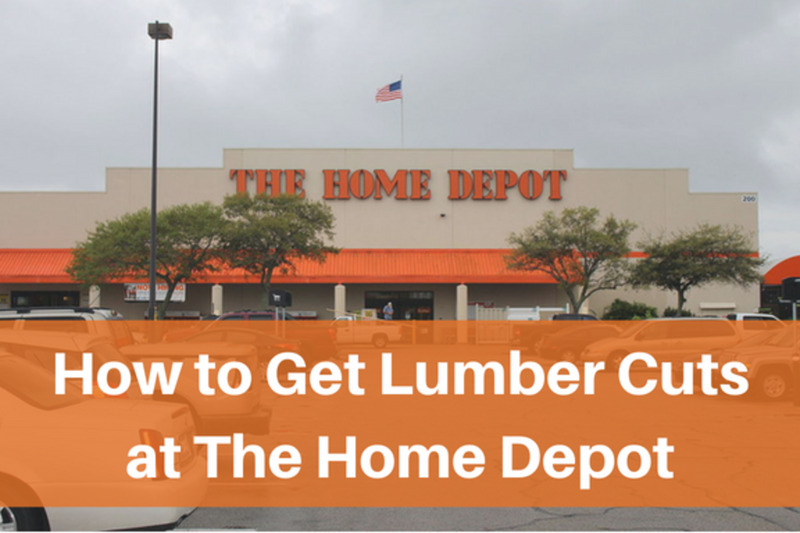 Pine stands up well and will last for several seasons, especially when the exterior is painted or stained. I like to use weathered wood whenever possible, to add interest and character to the finished birdhouse. Best of all, the cost for salvaged wood is often free! 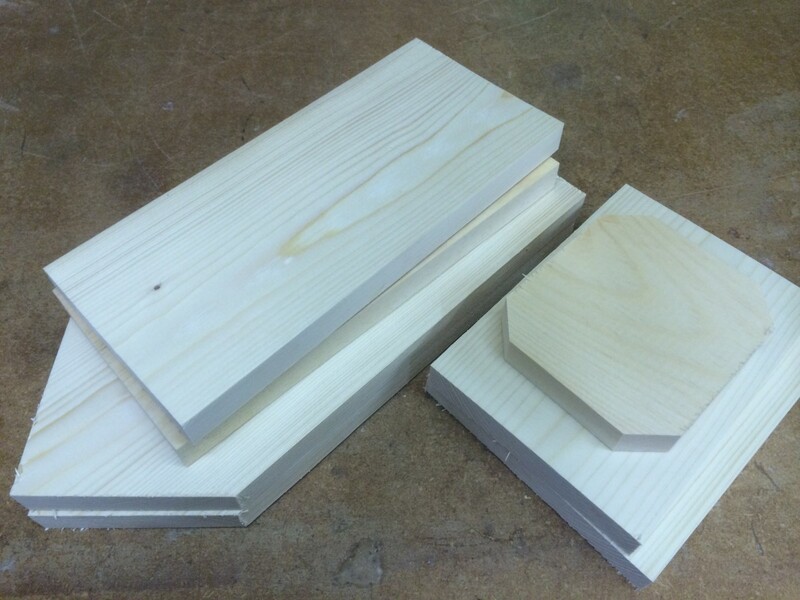 Cut the peaks for the roof on the front and back sections at a 45-degree angle. Birdhouse Entrance Holes: Size Matters! 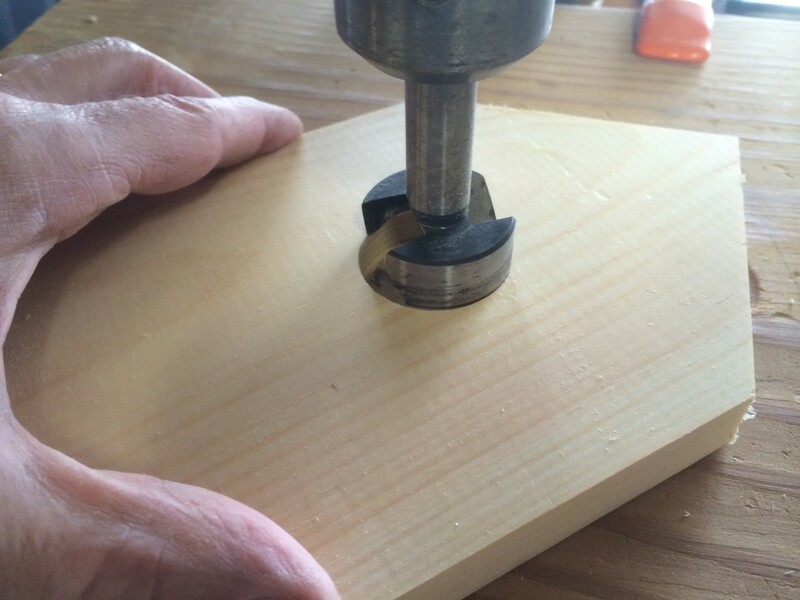 Using a 1-1/2 inch diameter bit, lay out and drill the entrance hole in the front section of the birdhouse. Measure up 8" from the bottom edge, centering the entrance hole across the width of the front section. 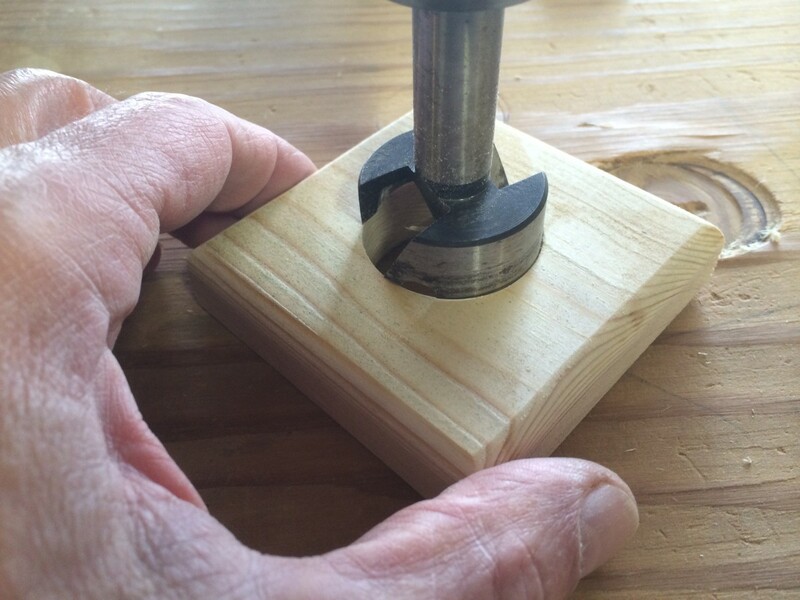 Use a Forstner bit, hole saw or paddle bit to drill the entrance hole. The size of the entrance hole is very important for attracting cavity-nesting birds. Too small, and the birds cannot get in. Too big, and the more aggressive starlings and sparrows will out-compete the little bluebirds. Eastern Bluebirds fit easily through a 1-1/2" entrance hole. The larger Mountain Bluebirds prefer 1-9/16" diameter entrance holes. Repeat the steps with Entrance Guard. 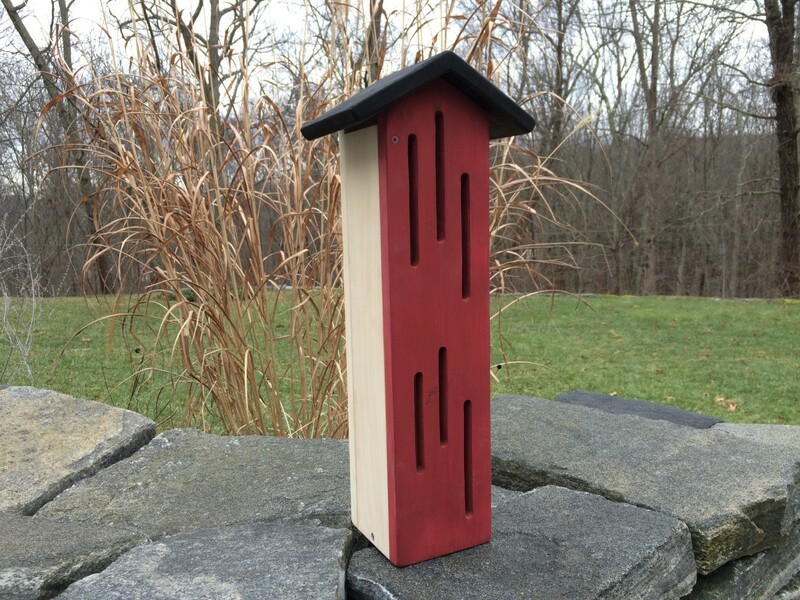 This simple entrance guard is 3-1/4" square and helps keep predators from reaching into the nesting box. To quickly find the center of the square, line up a straight edge on a diagonal across two opposite corners, and make a pencil mark near the center. Then, line up the straight edge across the opposite two corners, and draw another line near the center. The resulting "X" marks the exact center of the square. Do not add a perch to your birdhouses. Cavity nesting birds don't need a perch to enter a birdhouse, and a perch may only make it easier for a predator to get inside. This is the drill bit that I use to cut the entrance holes for many of my birdhouse projects. The Forstner drill bit cuts a clean hole, and does not wander across the work piece like a twist or spade drill bit. Add a Bit of Whimsey! The entrance guard protects the baby birds inside, and it looks good too! A simple pattern such as this star shape and some colorful paint adds a bit of pizazz to the entrance. 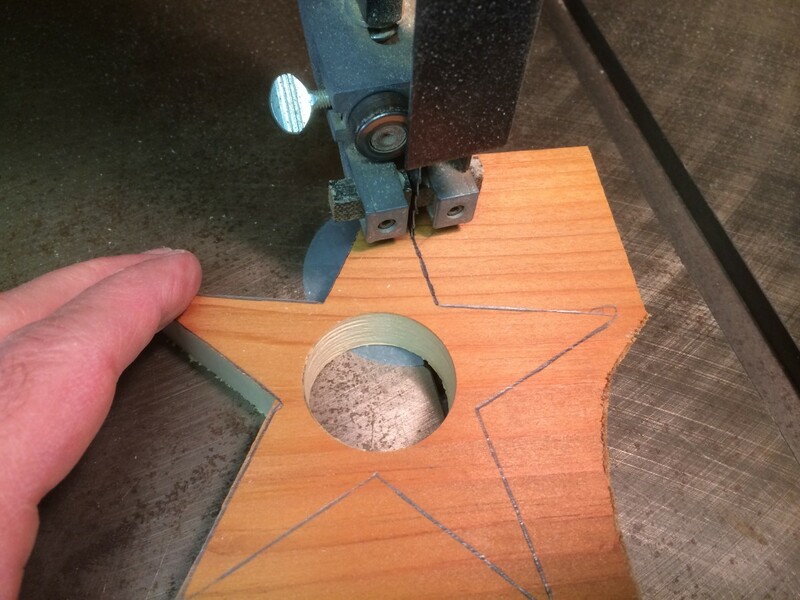 Sketch out the design on a piece of wood, drill the entrance hole, and then cut out the piece. The star shown here is about 5" across from point-to-point. 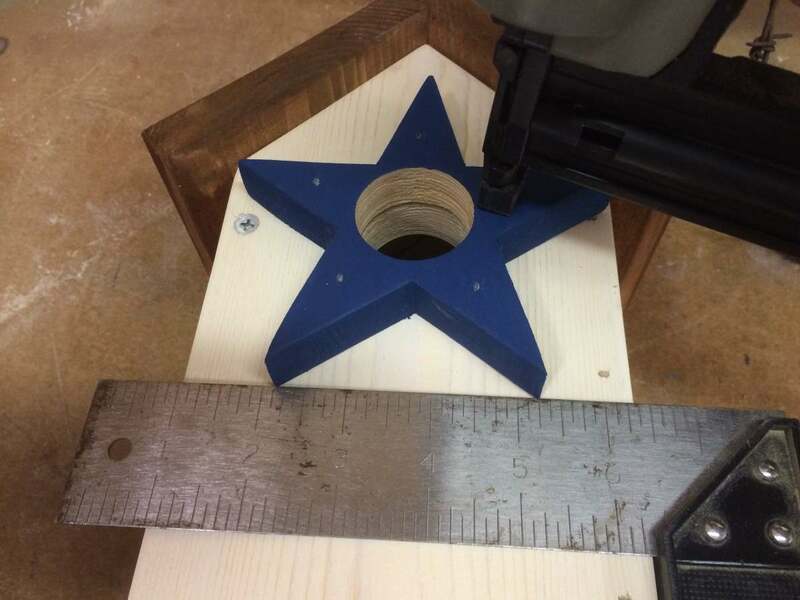 Lay out the pattern on a piece of wood, drill the entrance hole, and then cut out the star shape using a band saw or jigsaw. Be careful when drilling small pieces; the large spinning drill bits like the Forstner bit used here can bite into the wood and send it flying. Starting with a large piece of wood makes it easier to clamp down and hold smaller pieces safely in place while drilling. The floor section needs drainage holes to allow rainwater to drain away. A few 1/4" diameter holes drilled through the floor will work, but I prefer to cut away the corners. Cut each of the corners of the birdhouse floor, allowing any rainwater that enters the nest box to quickly drain away. Cutting away the corners also increases the air circulation inside the nest box, drawing cooler in through the floor and out through the side openings under the roof line. 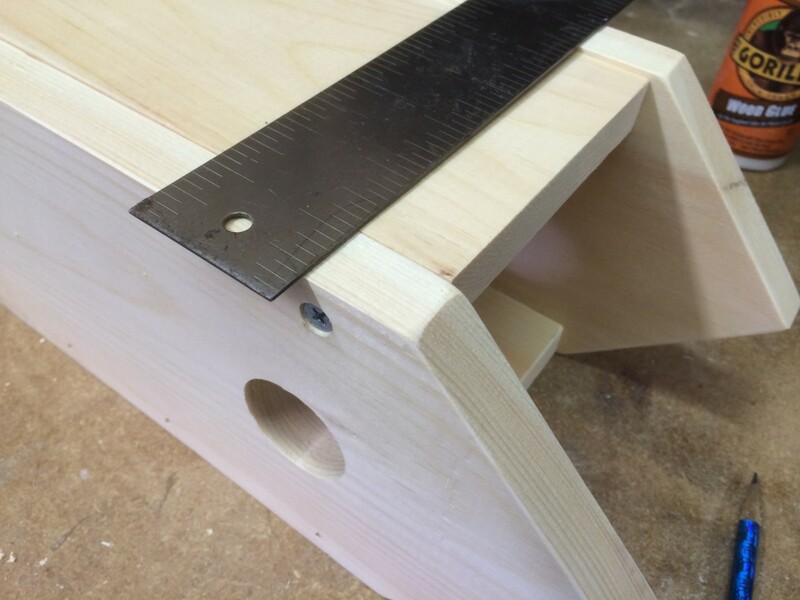 A power miter saw makes cutting off 3/4" from each of the corners quick and easy. After positioning the floor on the saw to slice off the first corner, mark the location of the floor piece on the miter saw (I used blue masking tape) and then line up the edges for each of the remaining cuts. 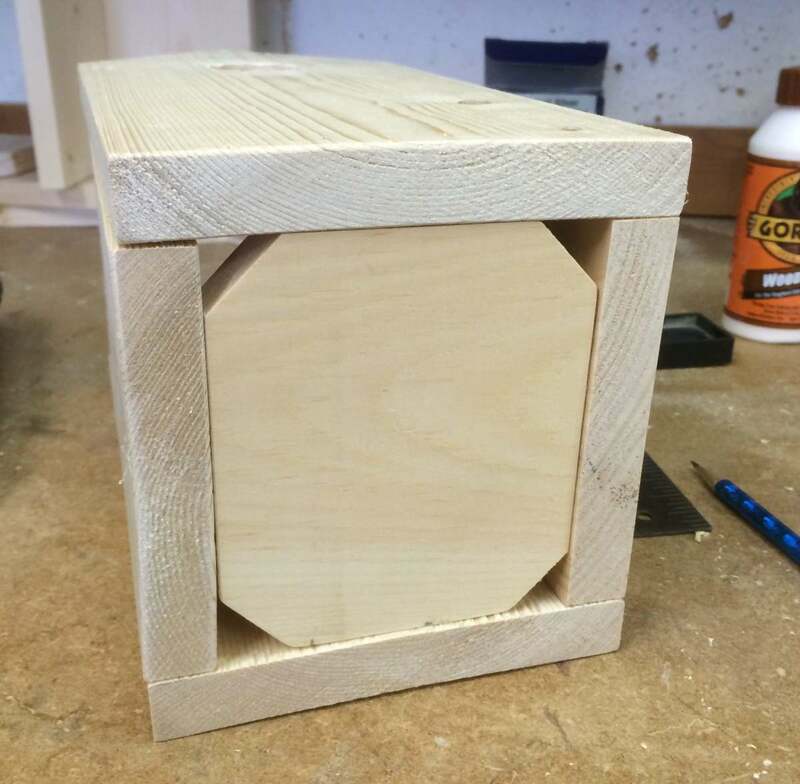 Begin assembling the nest box by attaching the front section to one of the side pieces. One side of the birdhouse is fixed, while the other side is hinged to allow access to the finished birdhouse for periodic cleaning. Line up the bottom edges of both pieces, and secure with weather resistant nails or screws. A bead of water-resistant glue helps to hold power of the pneumatic nails. Then, attach the floor followed by the back section with more nails or screws. Note: the top edge of the side piece will not quite meet with the angle section of the front. When fully assembled, this leaves a small gap for air circulation to the nest box. The overhanging roof keeps rain from entering the nest box through the gaps. 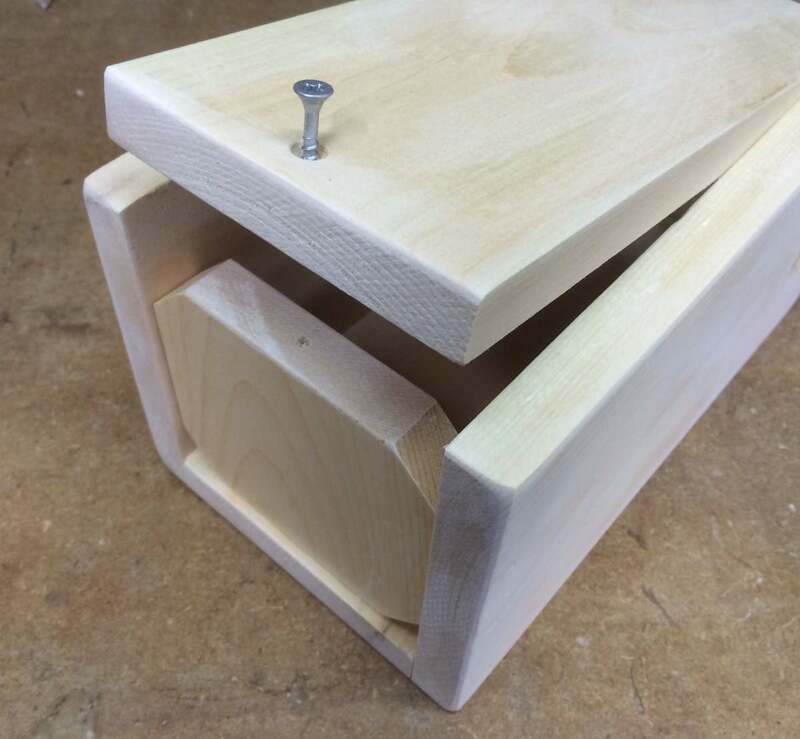 The second side is attached with just two screws, carefully positioned to form a pivot point and creating a door for access to the interior of the nest box. 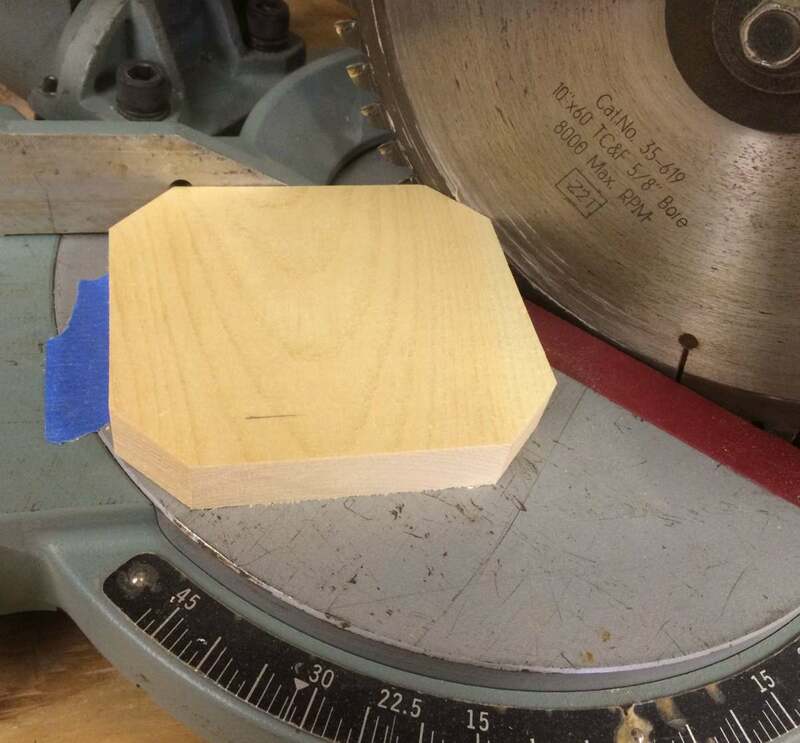 Measure down 1-1/4 inch from the point where the top of the side piece nearly meets the angle section of the front piece. Drill and countersink a hole, and then attach the pieces with a weather-resistant screw. Finish attaching the hinged side by driving another screw through the back (B) and into the door side, forming a pivot point. Using a square or straight edge, transfer the location of the first hinge screw across the side piece to the back edge. Positioning the hinge screws in the front and back sections directly across from each other forms a simple pivoting hinge of the door for access to the interior of the nesting box. 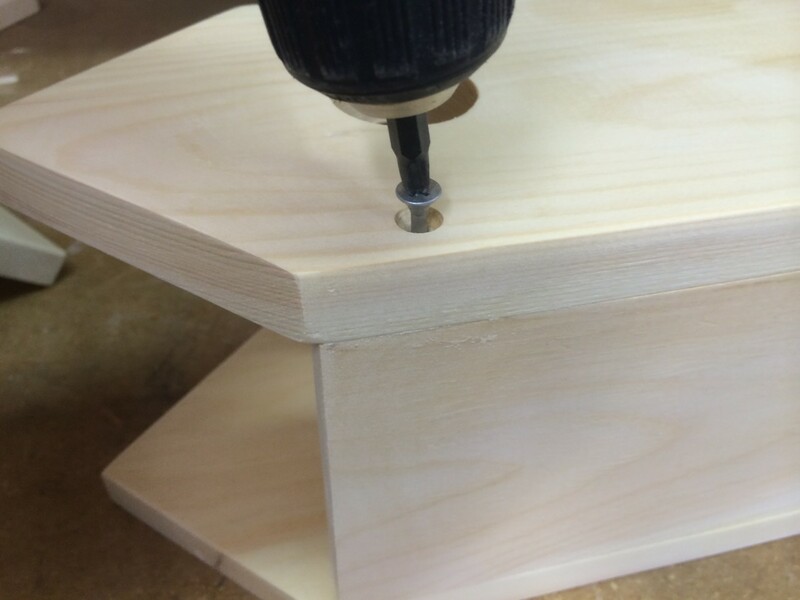 To keep to hinged door closed, drill and countersink a screw hole along the center of the bottom edge. Another short screw will secure the side in place, yet allow easy access for cleaning out the birdhouse. Here's a view of the floor section, showing the cutouts for drainage and air circulation. Attach the two roof sections together at a 90-degree angle with more nails or screws, position the 5-1/2" wide piece, so it overlaps the 4-3/4" wide piece, forming a peaked roof. Sand and stain the roof (if desired) before attaching the roof to the rest of the birdhouse. Sand all of the birdhouse edges to round over the corners and smooth the joints. 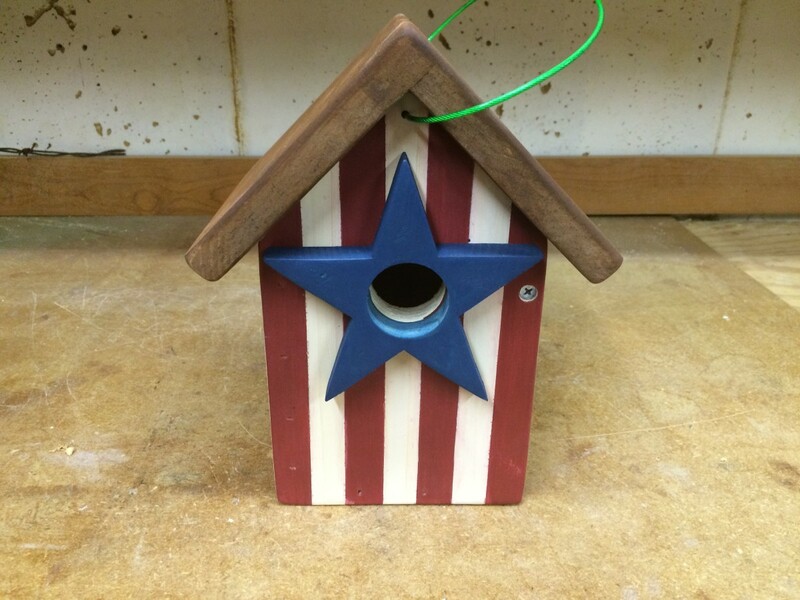 Breaking the sharp corners gives the birdhouse a finished look, and allows the paint and stain to adhere better. After sanding, paint or stain the exterior of the birdhouse, being careful not to cover any of the interior surfaces of the nesting box. I stained the exterior of the nesting boxes with a light stain called "Willow" for a rustic, white-washed appearance. The light colored background is a good canvas for adding colorfully painted detail and contrasts nicely with the dark walnut stained roof. The star shaped entrance guard was painted using blue latex paint. After the paint and stain dries, attach the entrance guard with glue and short brads. Use short, 1-1/4" nails that will not penetrate through to the inside of the nesting box and potentially harm the future residents. Attach the roof sections with more screws and nails. The large roof creates overhangs along the front and both sides to protect the inside of the nesting box from the rain. The picket fence posts were cut from the slats of an old pallet. I ripped the pallet slats into pieces that are approximately 3/8" x 3/8" square, and about 5" inches long. The lengths are staggered at random lengths, with the top ends cut at 45-degree angles. 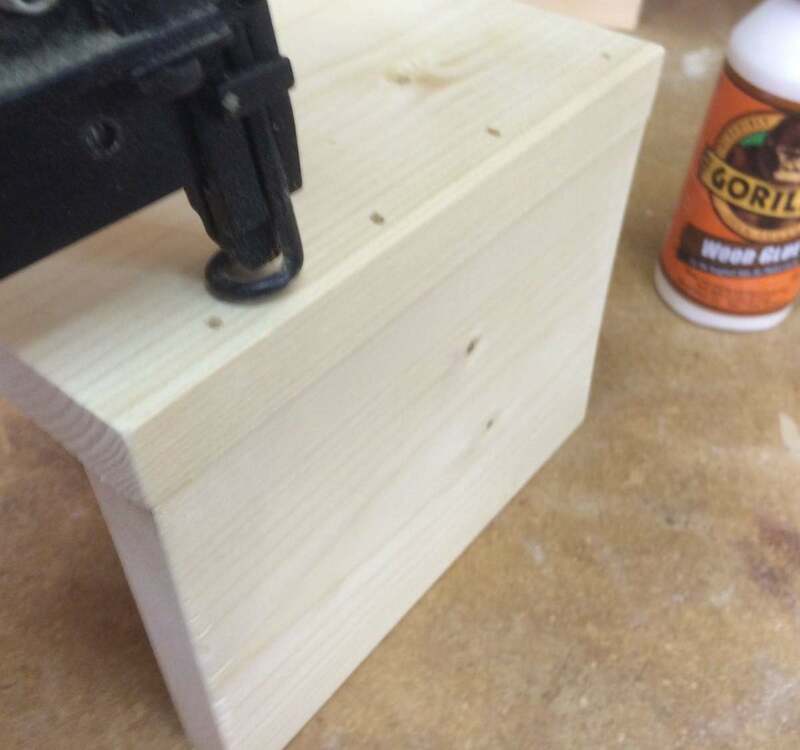 Attach the fence posts to the birdhouse with glue and short brads. The rusty barbed wire is attached with a couple of poultry staples and lightly pounded into shape with a hammer. The barbed wire is sharp, so be careful! Do you put up birdhouses for the birds? Not yet, but I want to build a birdhouse! Each of the birdhouses shown here are made using the same basic nest boxes and then customized with bits of found objects and decorative bits. My handcrafted birdhouses are made from new, reclaimed, recycled and re-purposed materials that give each piece its rustic folk art charm. 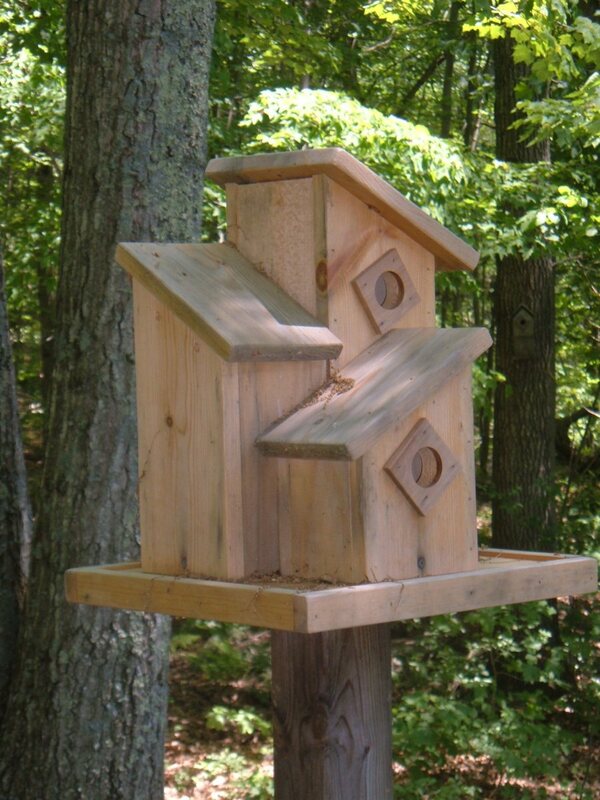 Add some color and textures to the nest boxes in your garden by adding a few of your own rustic birdhouse designs. The number of unique possibilities is limited only by your imagination. These birdhouses are built for the birds. 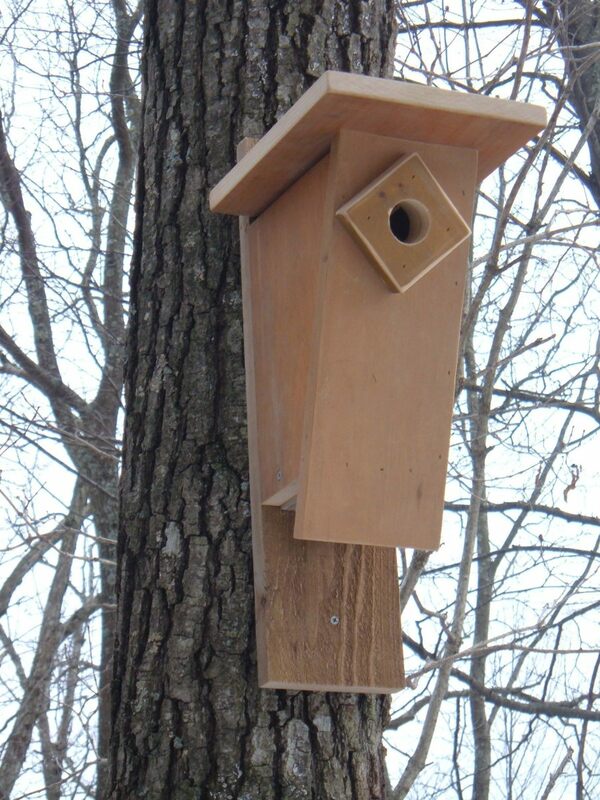 The nest box dimensions are designed to attract bluebirds, but other types cavity nesting birds will move in too. Hi, and thank you for visiting. The birdhouses are easy and inexpensive to make, costing less than $10 each for the wood. Hi, and thanks for stopping by. 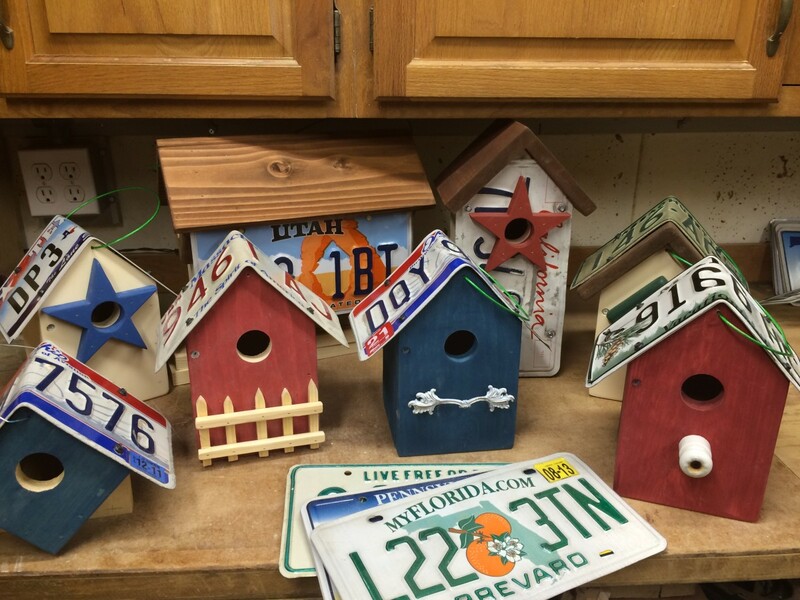 The birdhouses are made from pine, which can be purchased at local home centers. 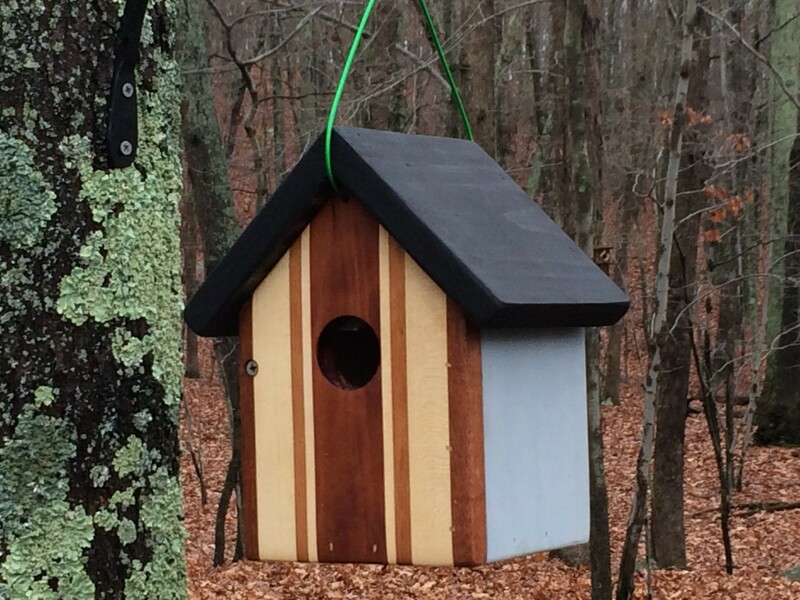 Each birdhouse costs about $10 to build, though you can save money by using pieces of reclaimed wood. I'm loving the birdhouse with the two stars. Beautiful hub. These houses would make great gifts as well. How much did they cost to make? Awesome and thumbs up - I love your little bird houses and the information on how to build them is very thorough with excellent support images. I thoroughly enjoyed it - If only I had the time to build them! You make me feel guilty. When we moved into our house years ago there was a birdhouse in a state of disrepair in the back yard. Over the years I allowed it to fall completely apart, and never replaced it. Now I see what I could have done. Oh well, at least the birds don't know what they've been missing. Missed sharing congrats on your Hub of the Day award on time, but am glad I came back when I had time to look your hub over. Nicely done and love the projects! Your birdhouses are darling and whimsical -- I would love to have a few of them. This is a great, very useful hub, Anthony, and I enjoyed reading it. Congratulations on the HOTD award, it is well-deserved. I love the birdhouses with the barbed wire. Sweet! Congratulations on Hub of the Day, Anthony. Congratulations! Very cute birdhouses. If I didn't have an outside cat I might try one. These are adorable! Great instructions so we can try one ourselves. My father used to make birdhouses from scraps. It would be sweet to carry on his tradition. Thanks for sharing this. This is a great hub. It really deserves to be HOTD. I love the way your content is organized and the images lined up to beautifully. Plus, your instructions are so well written. Congrats. Back to congratulate you on your HOTD today! Cool! Great project. I have a feeling that you are going to do very well here. Such a great idea! I love seeing all the different ways to decorate each birdhouse. Congrats on your HOTD!! These excellent and detailed instructions are well explained and expertly illustrated. I love the finishing touches you've selected for these wonderful bird houses. My Dad loved to hand make bird houses and I've still got a few of them around. He would have admired your design and finished product. Oh, congratulations on HoTD. Well deserved. Great hub. I have several birdcages in my garden, but all were bought. I love the creative looking kind that look like cottages. I have done an oil painting about one. One day I love to make my own. We have a drainpipe that attracts a family of phoebes every year too. Some types of birds including robins, phoebes and swifts prefer building their nests in shrubs, on drainpipes and in porch lights, and just won't use a birdhouse. If you have lots of different types of birds visiting your yard, the chances are good that there's a cavity nester around that will appreciate a comfy birdhouse. I have some purchased birdhouses and the birds (and there are a lot in my yard) still prefer the drainspouts on the sheds. I noticed that my houses don't have the nice drainage that your houses have and the holes may be the wrong size (finches, sparrows, thrashers)--will try making some to your specs. Thanks! What a fabulous project and awesome tutorial! My husband is retiring soon and I'd love to have a few of these... Bet you can tell what I'm thinking right now. Thanks for the inspiration! Nicely done--we live a huge birding area on the east coast and love having birdhouses--I will definitely be trying my hand at this. Another project I'd love to do with my husband. He loves your work as well. I always show him your new ideas and it gets him stirred up to make one. Great job Anthony! Great lens. These are darling. I know of someone who builds clay birdhouses. They're also quite lovely. Great hub. 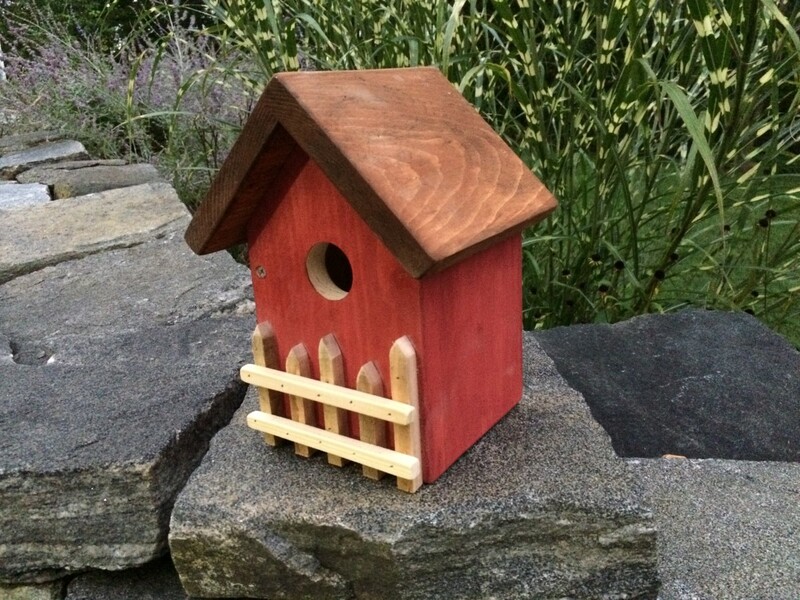 Exceptional hubpage -way to go :) Love birdhouses, and the detailed info you give would help anyone to build a bird house they could be proud of. 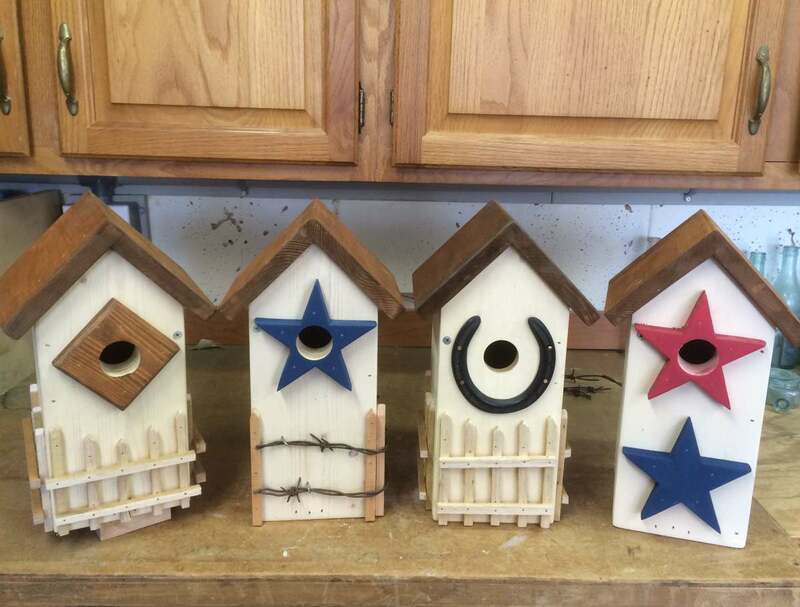 Those are some really sweet looking birdhouses and loving the directions! What an excellent hub on how to build a bird house. Great to see you on HubPages, Anthony.